Synopsis: Fifteen-year-old Amari lives a peaceful life in her African village until the day a group of white slave traders steals her, sells her, and sends her on a ship across the ocean to America, where she is sold once again. Polly is an indentured servant who must take on the burden of working off both of her parents’ indentures after their deaths. Both girls have very little left that is their own, except for a small spark of hope that makes them believe that perhaps they will be able to one day be free. Why I picked it up: I had heard good things about Draper’s work and was eager to delve into her writing. Why I finished it: Told in alternating viewpoints, Draper has woven together a tale of two unlikely friends whose fates become intertwined. They become forced to rely on each other, though at first they are reluctant to extend the olive branch. Amari is young and carefree until she is confronted with the harsh reality of the world beyond her village. She is forced to watch people she knows and loves die both in body and in spirit, planting seeds of doubt in her mind as to whether or not it is worth staying alive. In contrast, Polly is no stranger to hardship and the blatant unfairness of the system, struggling to become a lady as her mother wished for her. She struggles to seem competent in the face of her new employer, reluctant to accept help from the African slaves. Both girls are striving for the same goals, but it takes a while for them to recognize it. 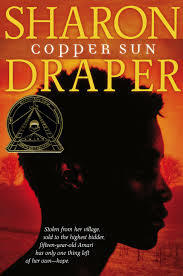 Draper’s characters represent two different forms of slavery in the early 18th century, and both shed light on the difficulties of maintaining a sense of self and a sense of hope. What intrigued me the most about the story was the thoroughness of Draper’s research and the partial list of resources provided in the afterword. The slave trade was an important, if not unfortunate, part of our history, and though this work is fictional, it gives the reader a starting point to do their own research. For many, this is part of a personal history; so many African Americans are descendants of those who survived the Middle Passage, part of who they are, part of their heritage. It’s a touching story that invites the reader to examine the complicated relationships on early American plantations and the idea that hope is eternal though it is often hard to see. 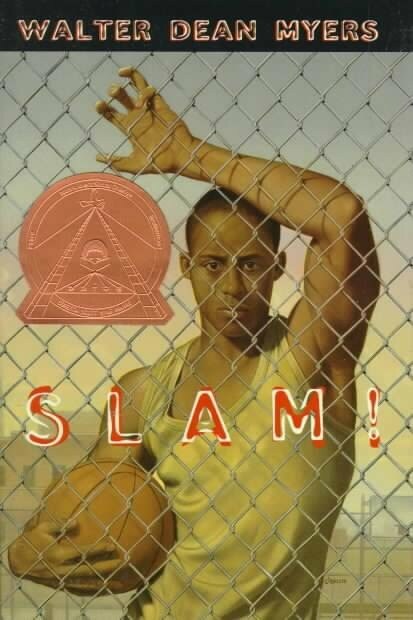 Why I picked it up: I wanted a non-fiction book about the history of Africans in America for younger readers, and Meyers’ book fit the bill. Why I finished it: The reader can almost feel the weight the author has taken on, the weight of the many that came before him and fought for freedom and equality. It gives us a brief history of some of the greatest minds of their generations and how they contributed to American history and African American history. 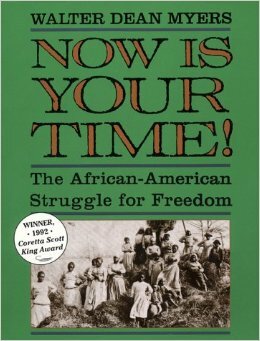 It gives us insight into the fight waged even among the Blacks for recognition and acceptance. As a white female, I won’t ever hope to understand the struggle experienced by African Americans, but learning and having knowledge of the struggle makes me more aware of the fight. I was intrigued at the tidbits of the author’s own history that were added to the narrative, illustrating for the reader the reasoning behind Meyers’ shouldering of the yoke of his ancestors. Life was not always easy for African Americans in the United States, and there are many places in America where things are still segregated, which tells me that the struggle for freedom lives on in the current and future generations. Will there ever be true equality between the races? Perhaps not, but I am not so disillusioned as to believe that there won’t be a common ground found that will pave the way for a nation of peoples who are all equal, on every level and in every sense of the word. This book is an excellent history of a people and a nation, a history of which we should take heed. It is a book about self-discovery as much as it is about the discovery of the potential for change and the need for it to occur. 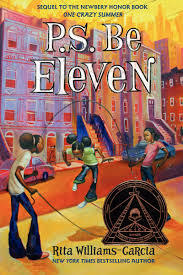 It may be a book aimed at young people, but it can be enjoyed and appreciated by all ages, races, sexes, and creeds. Why I picked it up: I had never heard of “the weeping time” and was curious about a fictional accounting of the events. Why I finished it: I feel like I’ve been saying this about quite a few of the books I have read so far this month, but this is really a powerful book. Though many of the characters are fictional, the small handful (Pierce Butler and his daughters, Sarah and Frances, Fanny Kemble, and the auctioneer) are real, as are the circumstances described in the book. It’s appalling to me that there was a time in our history where is was permissible to own people as though they were property, that they could be sold from person to person and moved from place to place as though they were nothing more than animals. While Lester only briefly touches on this notion, there is also some insight by the white slave owners about slavery and their views about how slaves should be treated. Some of these views are shared by the slaves (Solomon [an old slave at a plantation in Kentucky] believes that slavery is a good thing for him), others believe that freedom is the better option, even if they have to worry about things like putting a roof over their heads and where to get a job. I love that this novel is written in a dialogue. It reads more like a play with some insightful asides than a novel, offering the reader a glimpse of both the horror and hope experienced by African Americans in the years leading up to and during the Civil War. It speaks about the psychological effects the auction has on both Butler as the former owner, those slaves not sold in the auction, and those slaves that were sold. 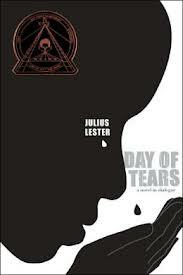 Day of Tears is a profound retelling of a little known historical event that will have a lasting impact on the reader even after they close the book. Synopsis: Cassie Logan and her brothers come face-to-face with the realities of what it means to be a black man who is friends with a white man when they stop for medicine on the way home from school. Why I picked it up: I’ve read some of Taylor’s other work and liked it. Why I finished it: Taylor writes with such clarity about a period of American history in which lines between black and white were becoming more clearly established. This story isn’t very long, but it hit me between the eyes because of the clear tension established within the first couple of pages. The Logan children certainly don’t live in a bubble, and they are well aware of the ‘rules’ and boundaries established to ‘keep them in line’. It’s a reminder that as the times changed, so did the people and their relationships. Even though Tom Bee has saved the life of John Wallace – a white storekeeper – he is still seen as a lesser man because of his race. The friendship forged between the two men seems to have changed more than both of them realized, and it makes both the reader and the Logans aware of the growing rift between black and white. Ginsburg’s illustrations are just as moving as Taylor’s words, bringing to life the characters and the conflict. The line drawings may seem simple at first, but they are detailed in a way that draws the reader deeper into the story. It makes the reader think hard about the issue of race in the South during the depression and the complications of trying to maintain what once was in the face of what is. Synopsis: Bud’s been with half a dozen temporary families since he’s been at the Home. Ever since his mother died four years ago, Bud has dreamed of finding his real family, the key to which he believes lies in the fliers which fill his suitcase of Herman E. Calloway and his famous band, the Dusky Devastators of the Depression!!!!!! And once Bud decides to skip town, there’s no stopping him until he finds his father. Why I picked it up: I really enjoyed Elijah of Buxton and I wanted to read more of Curtis’s work. Why I finished it: The way Curtis writes takes historical fiction to a new level for me. This particular story, as detailed in the afterword, is inspired by Curtis’ own family history. His grandfathers were a band leader and a railroad porter, much like two of the characters in the book, adding another layer of realism to the story. 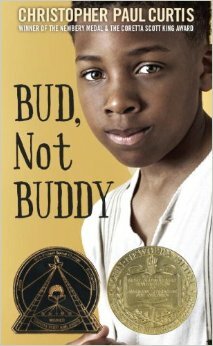 Bud’s story may be fictional, but everything about the story feels so very real to the reader. We are angered and frustrated by the treatment Bud receives while in the foster homes. We are scared for him when he decides to take matters into his own hands and venture out on his own to find his father. We cheer for him when he makes friends with the members of the Dusky Devastators. And while what he finds is much more unexpected, through Bud’s narrative we discover another meaning behind family. 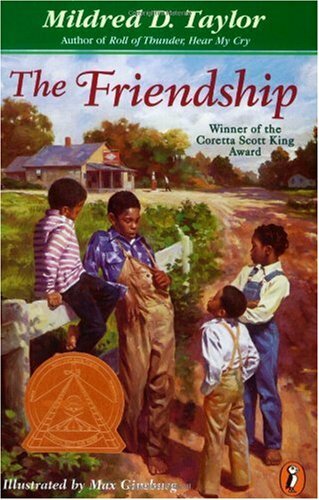 The reader gets a little slice of American history, as with most historical fiction, but I find that so many books about the depression don’t often focus on African Americans. I found it refreshing that Curtis explores this period through different eyes, much like Hesse did in Out of the Dust. Though Curtis explains that most of the research for his book came from other books, he laments not listening to the stories of his grandparents, missing out on the wealth of knowledge and the perspective that his elders offered to the future generations. So much like Curtis, I would encourage you to sit down with your parents and grandparents, to listen to their stories, write them down, save them up either in writing or as audio, because those memories are precious. We can read all we want about history in a book, but I would argue it is these personal histories that have a larger impact than anything we learn in an academic setting. Synopsis: Delphine and her sisters can’t wait to get home and tell Big Ma and Papa all about their adventures in Oakland with Cecile. But when they arrive back in Brooklyn, Delphine senses something is…different. The things the girls learned in Oakland from the Black Panthers aren’t seen as polite behavior by Big Ma. Papa has a new girlfriend that he wants to marry. Then there’s the fact that Uncle Darnell is coming back from the war. Seeking advice from Cecile, Delphine writes to her mother in hopes that she will have some guidance to offer her daughter. The only response she receives is a cryptic postscript: “Be eleven”. What does that even mean? How is Delphine supposed to be something she already is? Why I picked it up: The author was signing books at a library conference and the title intrigued me. Why I finished it: This book hit home for me on a number of different levels, namely on the subjects of how we relate to our family members and how we deal with changes that can seem sudden. Delphine is struggling to maintain a sense of normalcy even though she feels like the world is starting to fall apart: she’s not thrilled with her father’s new girlfriend, the kids at school don’t seem like the same people they were the year before, and she still has to look out for her sisters despite the fact that they are growing up as well. Delphine’s confusion at her mother’s advice to ‘be eleven’ is understandable, but as a reader it broke my heart because as hard as Delphine is trying to be grown, she’s forgetting to be a child. She’s putting her adult-like desires before the little excitements that come with being in the sixth grade. It is pointed out to her that her desire to look out for her sisters is repressing them, a comment that initially doesn’t sit well with Delphine until she begins to see for herself just how much she does for them. Set against the backdrop of the late 1960s, Garcia-Williams creates for the reader a lovingly contrasted picture to the one created in One Crazy Summer. While politics do not seem as heavy-handed in this sequel, the tensions still run high in regards to both the issue of race and the war in Vietnam, something touched upon by the return of Delphine’s uncle. It’s this almost invisible commentary on how the war affected our loved ones that provides more of a discussion into the end of the decade. This story is well-crafted and moving, providing the reader with another chance to hear about Delphine, Vonetta, and Fern, their family, and their journey toward becoming the strong individuals the reader knows they will be.